We've had a couple of tricky, off-beat themes for Blog Bites in the past editions, but this month, the theme is as simple and straightforward as can be- Sandwiches & Wraps. These foods are on my mind because summer is here in its full sticky sultry glory, along with the annual quota of picnics, trips and vacations. Lighter meals are perfect for eating on the go, great for lunch boxes and easy on the body when the weather gets too hot. The theme of sandwiches lends itself to a journey around the world to sample, say, English cucumber tea sandwiches, Indian chutney sandwiches, classic American grilled cheese and Mexican tortas. Burgers and hot dogs are also included, and our delightful vada pav is definitely part of the deal. Similarly, wraps are an opportunity to travel the globe, trying recipes for burritos, frankies, kati rolls and falafel-stuffed pitas, to mention just a few of the possibilities. You don't have to stick to classic combinations from particular cuisines. Sandwiches and wraps are also the perfect vehicle for summer produce, to use up leftovers and to create new flavor combinations using whatever you have on hand. You could also try to find recipes to replicate sandwiches and wraps you love eating in restaurants and fast food chains. This theme is pretty broad and you are welcome to use your imagination to interpret it. For instance, you could try recipes to make sandwich bread from scratch, or to make rolls (pav), or to try making your own sandwich spreads, such as preserves, nut butters and home-made mayonnaise. You could even try making sandwich dhokla as a savory treat. For a sweet treat, sandwich cookies would hit the spot, as would ice cream sandwiches. It is easy to fall into a rut when it comes to sandwiches and lunch ideas, so here is a chance to look though your bookmarked recipes and browse the archives of your favorite blogs, and find new favorites to add to your repertoire. As long as your recipe clearly ties in with the theme of Sandwiches & Wraps (and is inspired by another blogger, of course), it will be included. From now until July 25, look through your favorite blogs and try out recipes that fit the theme Sandwiches & Wraps. The recipe has to come from another blog. This is the whole premise of the Blog Bites event, so please turn to other blogs for inspiration. I will acknowledge the entries you send in by leaving a comment on your post and thanking you for the entry within 2-3 days. Check back on July 26 to see the round-up. Would your rice paper rolls be OK? This is just the thing I need! I am always stuck in a rut for sandwich and wrap fillings but can now source them all from this event! aw-chh! let me see what i can create cos i love sandwiches. Its almost as if you knew I was on a Sandwich diet :) I will have to find something now! I have two great recipes bookmarked and I am going to try and send those this time. Love the theme. hey ,its a lovely theme again..pls do count me in...have so many bookmarked recipes..
Oh my gosh I love that little crochet sandwich at the top, so cute!! Can you tell what kind of bread you've used in the shredded cheese sandwich picture? Also, where could I find it? Raaga- Yes, the rice paper wraps would fit into the theme. 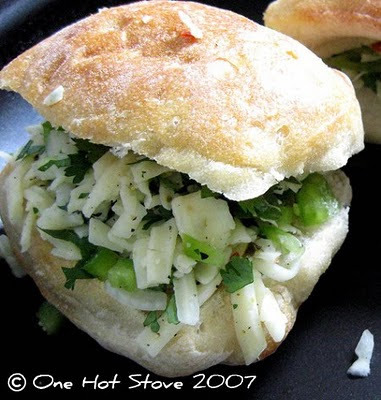 Neha S.- I'm always looking for fresh sandwich ideas too. bhagyashri- A sandwich diet sounds mighty tasty to me! Mints!- Great, looking forward to your entries. sonu-Glad you like the theme. Megan- Thanks :) it was a fun little project. Swati- It is a crusty roll, not sure what the specific name is, you can find it wherever fresh bread is sold like bakeries and the bread section of good food markets. Thanks to this theme, one of my drafts finally got posted! Hey Nupur.. this BB theme sounds like fun. I often make burger patty from other blogs. But I am a bit busy this month, will see if I manage to churn out anything suitable. Hope new job is going well. Cheerio. Here is my entry for the event. This by the way is a wonderful summer theme. I hope I can come up with a few more recipes before the deadline. Here is my entry for the event.. Thanks a lot for this beautiful theme..
Nice Theme. Had questions, is it ok if the recipe comes from some youtube video and not from a blog? I guess that should be fine, isnt it? Tanmaya- The recipe has to come from a blog. You Tube video recipes are not eligible for this theme. Thanks! Hey Nupur.. I just posted Lettuce Wraps http://ss-blogs-here.blogspot.com/2010/07/lettuce-wrap-with-sprouts-salad.html Not sure if those qualify for this theme. Feel free to decide either way. Cheers! I hope Non veg recipes are ok?